A New & Accurate Map of the South East part of Germany, containing the Electorate of Bavaria, A.Bp. of Saltzburg, K. of Bohemia, with the Queen of Hungary's Hereditary Dominions of Austria, Moravia, Styria, Carinthia, Carniola, Trent, Tirol. etc. 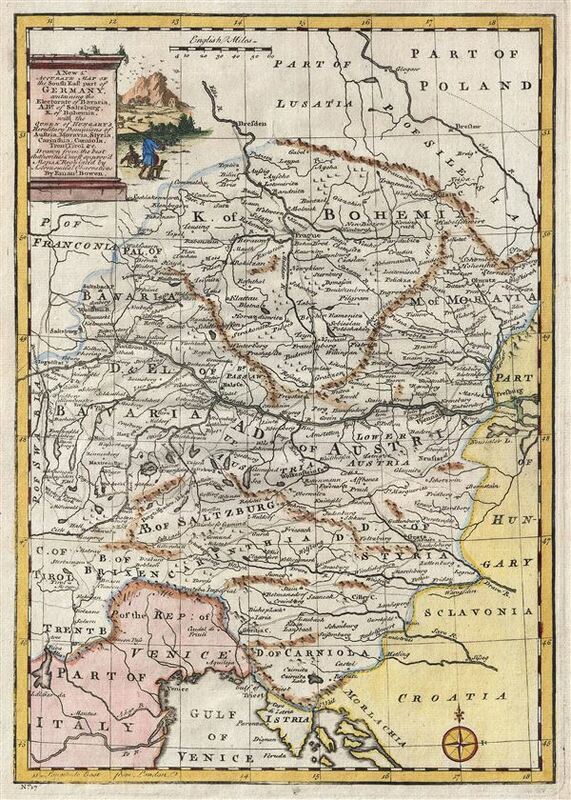 This is a beautiful 1747 map of the southeastern part of Germany and the Czech Republic by the British cartographer Emanuel Bowen. It includes the Kingdom of Bohemia (modern day Czech Republic), the Archbishopric of Saltzburg, and the Electorate of Bavaria. Centered on the Danube River, the map covers the modern day countries of Germany, Czech Republic and Austria from Dresden in the north to the Gulf of Venice in the South and from Salzburg in the west to Vienna in the East. Major cities including Prague, Brinn (Brno), Drasden (Dresden), Vienna, Olmutz (Olomouc), Saltzburg (Salzburg), Gratz (Graz) and several others are identified. Rivers, roads, lakes and other topography is also noted throughout, with mountains beautifully rendered in profile. Prior to the French Revolutionary War and the Congress of Vienna, the Holy Roman Empire's Circle of Bavaria included the Archbishopric of Salzburg, and was bordered by Franconia, Bohemia, Swabia, and Austria. After several wars with, and occupation by, Austria, the old Bavarian elector Max III Joseph died, leaving Bavaria and the electoral Palatinate to be governed once again in personal union. The Napoleonic Wars dissolved the Holy Roman Empire in 1806, briefly making Bavaria an independent kingdom and doubling its size, until Germany consolidated in 1871. This map includes a beautifully illustrated title cartouche in the upper left quadrant. This map was prepared by Emanuel Bowen as plate no. 17 for the 1747 issue of A Complete System of Geography. Rumsey 3733.016. Philips (atlases) 614 (1752 edition).